Big Bakehouse Bonanza Baked Goods Collection for sale. Buy online at Zingerman's Mail Order. Gourmet Gifts. Food Gifts. 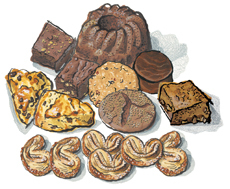 A great collection of Zingerman's baked goods. We fit a whole lot of Zingerman’s Bakehouse’s best into this big, beautiful gift box. Our big, beautiful, cartooned gift box with a no-nut Black Magic Brownie and a walnut-studded Magic Brownie, a Pecan Blondie, Oatmeal Raisin and Ginger Molasses Jump-Up Cookies, a Ginger Scone and a Currant Scone, a Raspberry Patti Pocket Hand Pie, a six pack of all butter Palmiers, and our nosher-sized Hot Cocoa Coffee cake.